Internationally accredited trainings with intakes in July, March and September each year. Professional Yoga Teacher Training providing graduates with the knowledge, skills and confidence to teach yoga safely and mindfully. Teaching yoga can help you create a life where your beliefs, thoughts and actions flow from your core values. 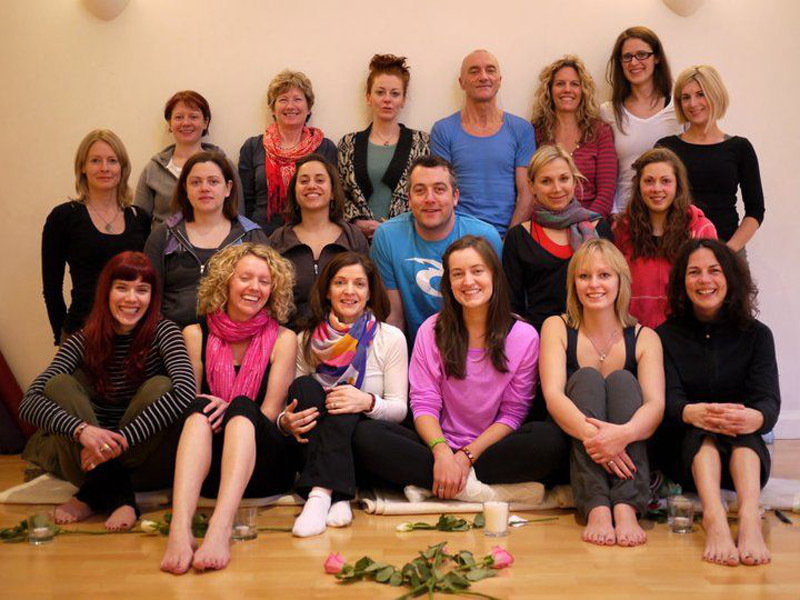 Whether you are interested in broadening your understanding of yoga or teaching yoga to others, this in-depth teacher training programme is for you. Our integrated and holistic 200-hour training is designed to foster a thorough learning environment where those who wish to teach are given the skills and knowledge to be creative, compassionate and confident teachers. This broad-based Yoga Teacher Training Programme is designed to honour the timeless teachings and many styles of yoga that have grown from the lineage of Krishnamacharya, the inspiration behind many styles of modern yoga including Ashtanga, Vinyasa, Hatha Flow, Iyengar Yoga and the teachings of his son Desikachar. Students will be given a solid foundation and the resources to develop their own teaching style based on this lineage. The training is grounded in yoga’s ancient roots as well as its modern blossoming; giving graduates the tools to adapt their teaching style to every level - from beginner to advanced - and every body type. Learn the complete yogic path and how to teach it professionally and creatively in this comprehensive certified programme that will launch you on a path to deeper personal understanding and the confidence to share this experience with others. A detailed analysis of yoga postures (asana) will be taught and options for safe, appropriate and creative class sequencing for every level and body type. Students will learn through guided yoga practices and teaching practicums. Elements of yogic lifestyle such as nutrition and self-care will be discussed and teacher trainees will gain insight into retaining a balanced, calm, centred presence at all times. Basic teaching ethics and principles such as class set-up, communication, principles of instruction, demonstration, observation, adjustments and sequencing will be studied. A solid understanding of the main body systems and organ functions will be offered as well as an in-depth study of the main muscles of movement, and common ailments and injuries in relation to yoga. Students will gain a thorough understanding of subtle body anatomy as it relates to the yoga tradition. This includes an understanding of the three energy bodies integral to the evolution of spirit (the gross, subtle and causal), the five koshas of the energy bodies, the chakra system and the nadis. The study of meditation and yogic breathing techniques (pranayama) will form a core element of the course. Various meditation practices such as yoga nidra, mantra meditation, chakra-based meditation, insight meditation will be taught. A key component of this, subtle body anatomy and yoga posture (asana) will include working with the Bandhas of the body - yoga locks - mula, uddiyana and jalandhara bandhas. Trainees will become familiar with the overview of the history of yoga and the birth of the various branches of yoga, and the eight-limbs of yoga according to the earliest known yogic sage Patanjali. Sections of ancient yogic scriptures will be studied among them the Yoga Sutras, The Bhagavad Gita, The Upanishads and The Hatha Yoga Pradipika. Fill out and return the Application Form. You will be notified within 14 days if your application is successful. If you have less than two years consistent yoga practice you will be invited to attend a drop-in class with one of our trainers. Or if you are outside Dublin with another agreed teacher. Once you are accepted you need to confirm your attendance on the course with a €500 deposit and notify us of your fee payment plan. Upon receipt of the deposit you will receive your ‘Acceptance Letter’ which includes details of the course such as times, the book list and the first homework assignment to be completed in preparation for the first module. We will see you on the first day of Training! Early-bird registration fee is €2,400 if paid in full two months before course starts. Basic fee is €2,600 to be paid one-month prior to course commencing. Installments: The course fee may be paid in two installments of €1,350 to be paid six weeks before first module and on a specified date six weeks before the third module. There is no installment option for One-Month Intensive programme. To guarantee your place we require a non-refundable deposit of €500. Payments are accepted by cash, cheque or laser/debit card. Course fees are non-refundable once the course starts, and include all tuition and mentoring, a detailed course manual and course materials. Additional costs: These will include your registration fee with Yoga Alliance (currently $25 once-off application fee plus $85USD annual registration) plus your required textbooks. A 300-page teacher training manual is included in the cost of the course. Students may attend yoga classes at The YogaRoom at a discounted rate. We are always happy to discuss any questions you may have. Please contant our teacher training programme director Ciara Cronin on +353 86 8832633 or +353 1 2196666 or by email [email protected].